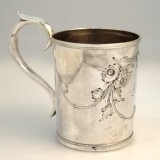 Early American coin silver 12 sided cup by Gale Wood & Hughes c.1839. This unusual cup measures 4 1/4" tall, 4 1/2" across the handle 3" in diameter and weighs 157 or 5 ozs Troy. The excellent original condition save for a few dents on the body and the handle, clear detail, with no removals, repairs or alterations, make this an especially attractive offering. Inscribed Awarded August 21st 1839 By S.P. Smith to Othellos Best Colt, the soft, warm, original finish is present, with no buffing or machine polishing. 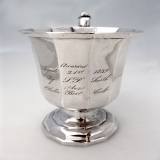 American sterling silver childâ€²s cup with ornate die rolled spreading foot, date marked for 1881 Gorham Silversmiths. This beautiful cup measures 3 1/4" tall, 2 3/4" in diameter and weighs 142 grams or 4.6 ozs Troy. Monogrammed J.Mc E. Ellis, 1883, the soft, warm, original finish is present save for a few dents, with no buffing or machine polishing. 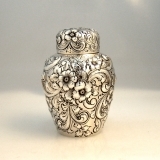 American sterling silver repousse tea caddy by Knowles Cincinnati OH c.1880. This beautiful tea caddy measures 4 1/2" tall, approx. 3 3/8" in diameter and weighs 209 grams 6.7 ozs Troy. The excellent original condition and clear detail, with no removals, repairs or alterations, make this an especially attractive offering. Monogrammed FW, the soft, warm, original finish is present, with no buffing or machine polishing. 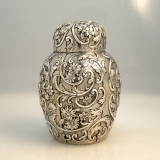 American sterling silver repousse tea caddy by Howard & co. of New York, c.1886. It features magnificently detailed floral and foliate hand chased embellishment. This beautiful tea caddy measures 4" tall, approx. 3" in diameter and weighs 137 grams 4.4 ozs Troy. The excellent original condition and clear, crisp detail, with no monograms, removals, repairs or alterations, make this an especially attractive offering. The soft, warm, original finish is present, with no buffing or machine polishing. 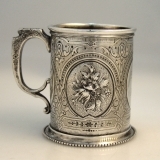 American coin silver child′s cup with ornate floral repousse decorations, marked Premium Fair Mc Lean County 1857, retailed by Jones Shreve.Brown & Co Boston. This beautiful cup measures 3 1/2" tall, 2 3/4" in diameter and weighs 114 grams or 3.7 ozs Troy. Monogrammed HL, the soft, warm, original finish is present, with no buffing or machine polishing. 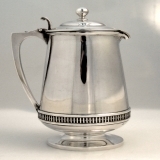 American sterling silver childâ€²s cup Tiffany & Co, c.1920. Original in the Clearwater Collection Metropolitan Museum Of Art. Reproduction Original by John Dixwell Boston 1680 1725. This handsome cup measures 3 3/8" tall, 4 1/2" across the handle, 2 7/8" in diameter and weighs 192 grams or 6.2 ozs Troy. The excellent original condition and clear, crisp detail, with no monograms, removals, repairs or alterations, make this an especially attractive offering. The soft, warm, original finish is present, with no buffing or machine polishing. 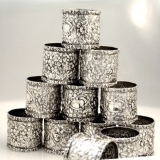 American sterling silver dozen napkin rings in the Rose Pattern by Stieff Silversmiths of Baltimore Maryland. c.1900. It is unusual to find an unmonogrammed set of 12 with old marks, especially in such nice condition. These ornate, repousse napkin rings each measure 1 3/4" in diameter, 1 5/8" tall and weigh 37 grams or 1.2 ozs Troy. The excellent original condition and clear, crisp detail, with no monograms, removals, repairs or alterations, make this an especially attractive offering. The soft, warm, original finish is present, with no buffing or machine polishing. 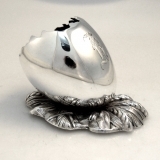 American sterling silver figural toothpick holder in the shape of an egg on a base of wheat stalks by Gorham Silversmiths date marked for 1869. Dimensions: 2 1/4" tall, 3" wide and weighs 55 grams or 1.8 ozs Troy. The excellent original condition and clear detail, with no removals, repairs or alterations, make this an especially attractive offering. Monogrammed K, the soft, warm, original finish is present, with no buffing or machine polishing. 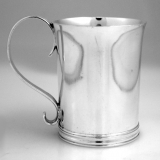 American sterling silver syrup pitcher by John R Wendt c. 1865. This elegant pitcher measures 5 7/8" tall and weighs 235 grams or 7.6 ozs Troy. The excellent original condition and clear, crisp detail, with no monograms, removals, repairs or alterations, make this an especially attractive offering. The soft, warm, original finish is present, with no buffing or machine polishing. 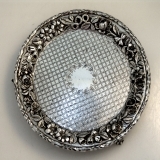 American sterling silver footed salver in a Repousse pattern by Kirk & Sons, 1890. This handsome round salver with cast claw feet and a central area with fancy bright cut decorations measures 6 1/8" in diameter and weighs 143 grams or 4.6 ozs. Troy. The excellent original condition and clear, crisp detail, with no monograms, removals, repairs or alterations, make this an especially attractive offering. The soft, warm, original finish is present, with no buffing or machine polishing. 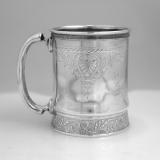 American Aesthetic sterling silver child′s cup made by Gorham Silversmiths date marked for 1875. This elegant cup measures 3 1/4" tall, 4" across the handle, 2 5/8" in diameter and weighs 165 grams or 5.3 ozs Troy. The excellent original condition and clear detail, with no removals, repairs or alterations, make this an especially attractive offering. Inscribed Mabel Searcy White Jan. 1st 1876 , the soft, warm, original finish is present, with no buffing or machine polishing. 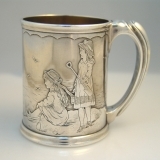 American Sterling Silver Baby Cup having a straight sided circular body and an acid etched decorations of two young girls on a beach. This handsome cup has a large see weed draped acid etched shell acting as a reserve for the inscription Preston Burch from CD Farrar. Dimensions: 3 1/4" tall, 2 7/8" diameter and weighs 187 grams or 6 ozs. Troy. The interior of this very useful baby cup is gilt. The excellent original condition and clear detail exept for a dent on the hollow handle, no removals, repairs or alterations, make this an especially attractive offering. Inscribed as described above, the soft, warm, original finish is present, with no buffing or machine polishing. 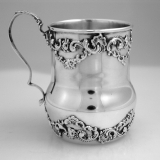 American sterling silver baby cup Merrill Shops NY 1895. This handsome cup has upper and lower bands of applied floral shell and scroll drapery. The double reverse C scroll handle has a foliate thumb piece. The cup is 2" tall, 2 1/2" diameter and weighs 54 grams or 1.7 ozs. Troy. The excellent original condition and clear detail, with no removals, repairs or alterations, make this an especially attractive offering. This cup has a crest of a rampant lion holding a sheaf of wheat; the soft, warm, original finish is present, with no buffing or machine polishing. 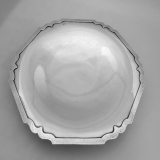 American sterling silver footed cake plate in the Dolores pattern by Shreve and Co, San Francisco c.1915. This handsome serving plate is 10" in diameter, 1 1/2" high and weighs a substaltial 373 grams or 12 ozs. Troy. 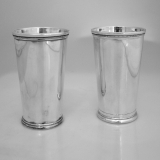 The applied, hammered rims are in excellent condition and show nicely detailed hammer marks, The excellent original condition and clear, crisp detail, with no monograms, removals, repairs or alterations, make this an especially attractive offering. The soft, warm, original antique finish is present, with no buffing or machine polishing. American coin silver footed salver by William Gale and Son of New York City, date marked 1856. 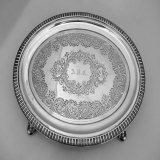 This handsome oval salver has an egg and dart applied border, cast scroll and shell feet and a central area with fancy chasding and engraving surrounding the period monogram A. R. C. The salver is 11" - 8", 1" high and weighs 500 grams or 16.1 ozs. Troy. The excellent original condition and clear, crisp detail, with no removals, repairs or alterations, make this an especially attractive offering. Monogrammed as described above, the soft, warm, original antique finish is present, with no buffing or machine polishing. English sterling silver napkin ring London 1916. 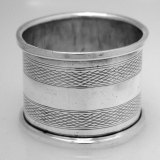 This handsome napkin ring measures 1 3/4" - 1 1/8" and weighs 33 grams or 1.1 ozs Troy. The excellent original condition and clear, crisp detail, with no monograms, removals, repairs or alterations, make this an especially attractive offering. The soft, warm, original finish is present, with no buffing or machine polishing. 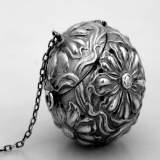 American sterling silver Art Nouveau floral repousse large tea ball made by the Websterr Company, c.1890 - 1910. 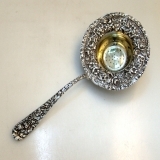 This exquisite, ornate tea ball has a strong hinge and its original chain and is 1 3/4" in diameter and weighs 24 grams. The excellent original condition and clear detail, with no monograms, removals, repairs or alterations, make this an especially attractive offering. The soft, warm, original antique finish is present, with no buffing or machine polishing. American sterling silver sealing wax tray, candle holder and monogrammed seal by Gorham Silversmiths, c.1890. The special order tray has an applied, beautifully detailed, intricately designed scroll work border and a curved stem candle holder whose stem acts as a handle for the tray. The tray has the pattern number, 1258, enclosed within a rectangle, as well as the Gorham marks. Included with the tray, is a wax seal made by Gorham, having a twist handle with a scroll finial attached to a shaped seal, monogrammed, in ornate, period script, EFB. 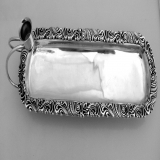 The tray is not monogrammed and is 8 1/4" long, 3 1/8" wide, and, with the 4" seal, weighs 146 grams or 4.7 ozs. Troy. The excellent original condition and clear, crisp detail, with no removals, repairs or alterations, make this an especially attractive offering. Monogrammed as described above, the soft, warm, original antique finish is present, with no buffing or machine polishing. 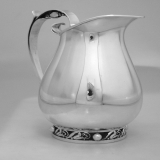 American sterling silver water pitcher in a Blossom pattern by Alphonse La Paglia and executed by International Silversmiths, c.1950. This exquisitely detailed pitcher embodies the highest ideals of craftsmanship and design. It stands 8 1/2" tall, is 6 1/2" in diameter and weighs a substantial 902 grams or 29 ozs. Troy. The excellent original condition and clear, crisp detail, with no monograms, removals, repairs or alterations, make this an especially attractive offering. The soft, warm, original finish is present, with no buffing or machine polishing. 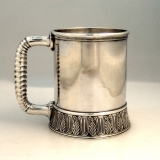 American sterling silver baroque style napkin ring by F.Whiting c.1900. Dimensions: 1 3/4" - 1 1/2", weight 35 grams or 1.12 ozs Troy. The excellent original condition and clear detail, with no removals, repairs or alterations, make this an especially attractive offering. Monogrammed Helen, the soft, warm, original antique finish is present, with no buffing or machine polishing. American coin silver napkin ring by Wood & Hughes 1881. 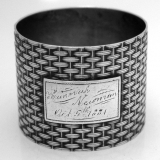 This attractive napkin ring has a heavily embossed allover basket weave design with an applied rectangular engraved border cartouche containing an ornate monogram Hannah Newman Oct 5th 1881. Dimensions: 1 5/8" - 1 1/4", weight 33 grams or 1.06 ozs Troy. The excellent original condition and clear, crisp detail, with no removals, repairs or alterations, make this an especially attractive offering. Monogrammed as described above, the soft, warm, original antique finish is present, with no buffing or machine polishing. 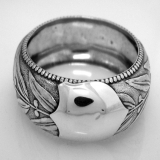 American coin silver Repose napkin ring c. 1880. Dimensions: 1 3/4" - 1 7/8", weight 48 grams or 1.54 ozs Troy. The excellent original condition and clear detail, with no removals, repairs or alterations, make this an especially attractive offering. Monogrammed Ernest H Fluharty, the soft, warm, original antique finish is present, with no buffing or machine polishing. English sterling silver engine turn napkin ring date marked 1914, Birmingham. Dimensions: 1 3/4" - 1 1/8", weight 14 grams or 0.45 ozs Troy. The excellent original condition and clear detail, with no removals, monograms, repairs or alterations, make this an especially attractive offering. The soft, warm, original antique finish is present, with no buffing or machine polishing. 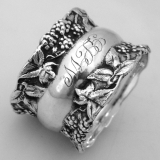 American sterling silver baroque style napkin ring c. 1900. Dimensions: 1 3/4" - 1 3/4", weight 36 grams or 1.16 ozs Troy. The excellent original condition and clear detail, with no removals, repairs or alterations, make this an especially attractive offering. Monogrammed MPF, the soft, warm, original antique finish is present, with no buffing or machine polishing. 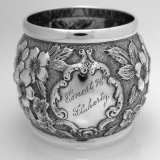 American coin silver napkin ring having repeating laurel leaf and berry decorations set on a stippled background with beaded rims, c. 1860. Dimensions: 2 1/3" - 3/4", weight 20 grams. The excellent original condition and clear detail, with no removals, monograms, repairs or alterations, make this an especially attractive offering. The soft, warm, original antique finish is present, with no buffing or machine polishing. American coin silver napkin ring c. 1875. Dimensions: 1 3/4" - 1 1/8", weight 24 grams or 0.77 ozs Troy. The excellent original condition and clear detail, with no removals, repairs or alterations, make this an especially attractive offering. Monogrammed HPP, the soft, warm, original antique finish is present, with no buffing or machine polishing. 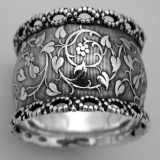 American sterling silver napkin ring with applied raspberry and leaf borders, made by Webster c.1900. 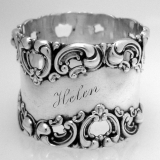 This beautiful napkin ring measures 1 3/4" - 1 1/4", weighs 18 grams or 0.6 ozs Troy. The excellent original condition and clear detail, with no removals, repairs or alterations, make this an especially attractive offering. Monogrammed GLW, the soft, warm, original finish is present, with no buffing or machine polishing.